Palestinian prisoners in Gilboa prison announced their participation in the July 15 Anger Strike, a general strike of Palestinians in the ’48 occupied areas, against the Prawer Plan, which will displace up to 40,000 Palestinian Bedouins and destroy their villages. Addameer reported that the prisoners of Gilboa prison had issued a statement on the strike. 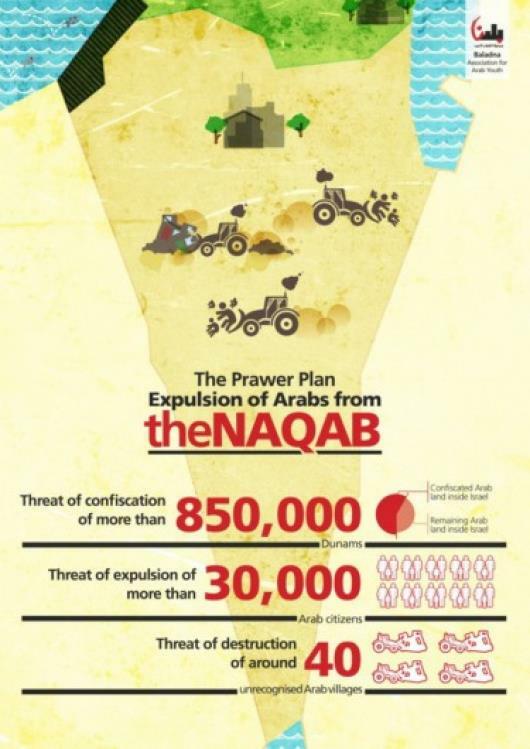 On Monday, July 15, when a general strike was announced inside the occupied lands of 1948 to reject the Prawer Plan, which confiscates the lands of the Negev (Naqab) and the displacement of the Bedouin, called by the Higher Follow-Up Committee in the ’48 areas. We have decided in Gilboa prison to join the national strike within the prison, refusing to hold events on Monday and closing prison facilities, recognizing that we are profoundly connected to all of the struggles of our people and our homeland, in defense of our identity, our belonging, our land and our memory.